Long-time Ojai resident and painter, Nancy is a former student of established British trompe l‘oeil painter Robert Walker, and has worked out of Kim Smith’s studio in Ojai. Nancy is a member of the Santa Barbara Art Association, she is a member of Ojai Art Center, SCAPE (Southern California Artists Painting for the Environment,) Carpinteria Valley Arts Council, the TOPA plein air group, and the Buenaventura Art Association. Nancy has shown her work in many places, including Ojai’s Art in the Park, the Ojai Art Center, the Harbor Village and Buenaventura Galleries in Ventura, 855 at The Arts Center in Carpenteria, and Community Memorial Hospital’s ongoing exhibits. 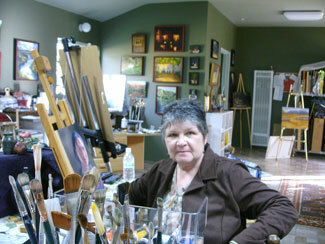 Nancy is a featured artist at Massarella Gallery and Pottery School in Ojai. Her painting “A Fragrant Read” was chosen for the 2008 Lavender Festival poster.